Tissue/ cell preparation (Mouse) - C57BL/10 mouse splenic T cells and concanavalin A activated C57BL/10 splenocytes. This product or portions thereof is manufactured under license from Carnegie Mellon University under U.S. Patent Number 5,268,486 and related patents. Cy and CyDye are trademarks of GE Healthcare Limited. Our Abpromise guarantee covers the use of ab25533 in the following tested applications. 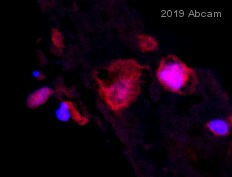 Integrin alpha-M/beta-2 is implicated in various adhesive interactions of monocytes, macrophages and granulocytes as well as in mediating the uptake of complement-coated particles. 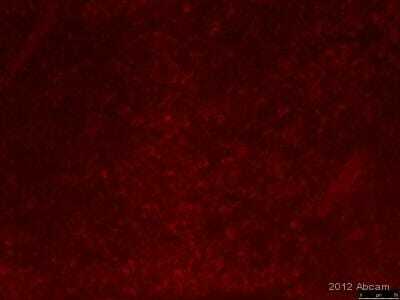 It is identical with CR-3, the receptor for the iC3b fragment of the third complement component. It probably recognizes the R-G-D peptide in C3b. Integrin alpha-M/beta-2 is also a receptor for fibrinogen, factor X and ICAM1. It recognizes P1 and P2 peptides of fibrinogen gamma chain. 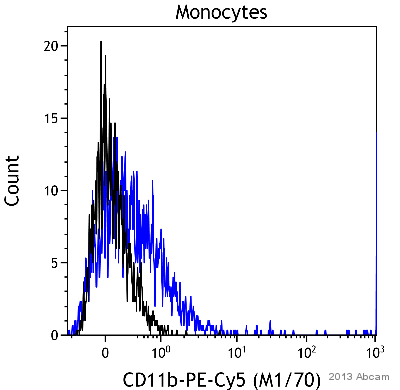 Predominantly expressed in monocytes and granulocytes. Genetic variations in ITGAM has been associated with susceptibility to systemic lupus erythematosus type 6 (SLEB6) [MIM:609939]. Systemic lupus erythematosus (SLE) is a chronic, inflammatory and often febrile multisystemic disorder of connective tissue. It affects principally the skin, joints, kidneys and serosal membranes. It is thought to represent a failure of the regulatory mechanisms of the autoimmune system. 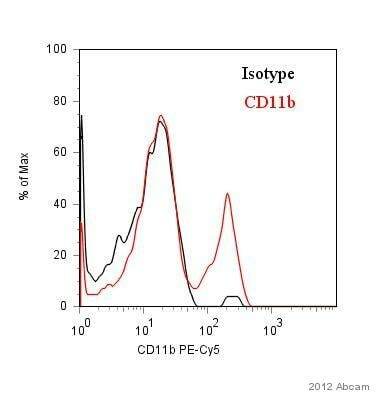 Flow Cytometry analysis of C57Bl/6 bone marrow cells labeling CD11b with ab25533 at 0.125 µg (solid line) or Rat IgG2b (PE/Cy5®) isotype control at 0.125 µg (dashed line). 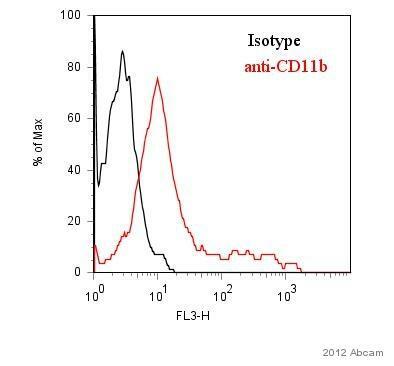 ab25533 staining CD11b in Human leukocytes by Flow Cytometry. Cells were prepared for staining after red blood cell lysis and were fixed in paraformaldehyde. 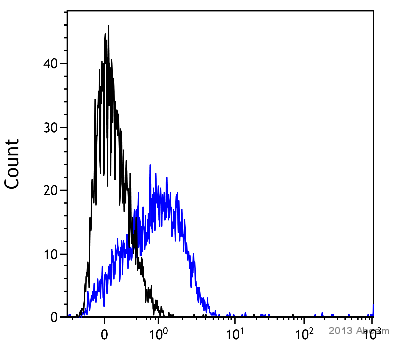 The sample was incubated with the primary antibody (1/50 in PBS/BSA 1%) for 30 minutes at 4°C. Gating strategy: Neutrophils. Scatter plot showing mouse blood leukocyte cells stained with ab25533 (green). The cells were harvested from blood drawn from mice and prepared in PBS/BSA 1%. Cells were fixed in formaldehyde. The cells were then incubated in 1x PBS / 1% BSA to block non-specific protein-protein interactions followed by the antibody (1/100) for 30 min at 4ºC. Isotype control antibody (red) was used under the same conditions. 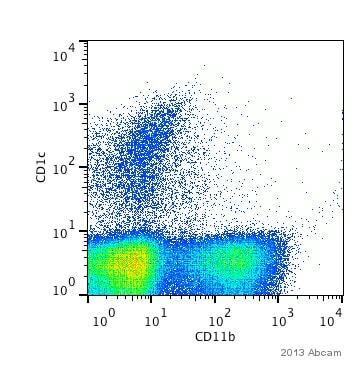 ab25533 staining CD11b in Rat splenocytes by Flow Cytometry. Rat spleen was homogenized and red blood cells were lysed in PBS + 1% BSA and 0.01% sodium azide. The sample was incubated with the primary antibody (1/100 in PBS + 1% BSA and 0.01% sodium azide) for 1 hour at 4°C. Publishing research using ab25533? Please let us know so that we can cite the reference in this datasheet. 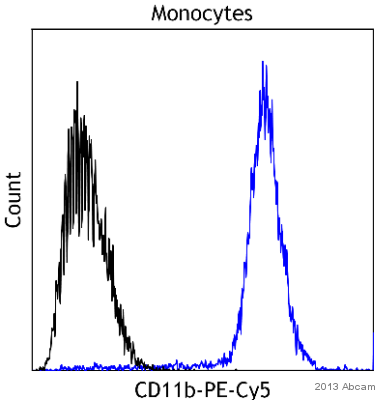 How is product Anti-CD11b antibody [M1/70] (PE/Cy5®) (ab25533) purified? 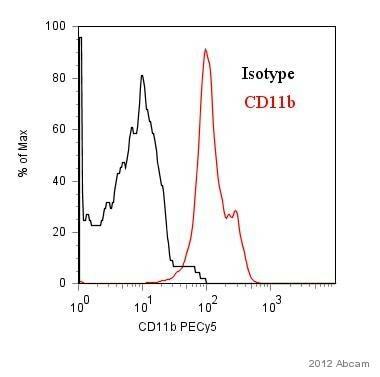 Product Anti-CD11b antibody [M1/70] (PE/Cy5®) (ab25533) is purified using a Protein G affinity purification column.